For awhile there, I wondered if it was gonna be a complete wash-out due to the fact that it was literally pouring rain most of the afternoon. A couple hours before they were due to fire them off, all the bad weather headed west, the skies cleared and there was a gorgeous sunset. It was an absolutely beautiful night. I thought that Biloxi put on an excellent show - bigger and even longer than any of us expected - especially with the economy and all of the budget cuts going on across the country. I read of some towns that had to totally forgo their fireworks displays altogether and that is sad. So Dad, who I think was as excited as the rest of us about going, had not only brought the standard chips and fried chicken with all the fixin's, he also prepared this huge pot of large, plump, and nicely spiced hot boiled shrimp for us to munch on. Mom said he was out using the boiler in the pouring rain, and, true to form, Mom was doling out all of the leftover food at the dock when we got back in. The Cajun and I were the fortunate recipients of the shrimp, yay! Have I mentioned how much I love my in-laws?? I have been having a craving for some shrimp and macaroni salad here lately, so I knew right away exactly where at least some of those shrimp were gonna go! 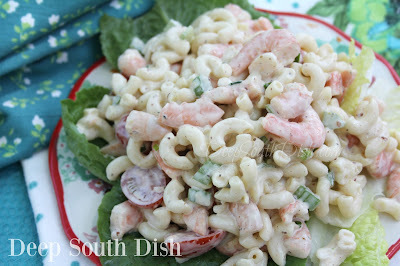 Now, this is a simple, unpretentious macaroni salad that relies on the shrimp to be the central figure, though I've included some suggested stir-ins that I have used before - depending on my mood at the time. Sometimes though, simple is just perfect. Down here along the Gulf Coast, we generally use shrimp that has been cooked from raw and is highly seasoned, like leftover from a shrimp boil, which by the way, here's my my boil mix I promised to post. If you are using frozen, pre-cooked shrimp, you'll want to taste the salad at the end and make any adjustments needed to boost the seasonings for the salad. I like to add a little pickle juice - it just transforms mayo based pasta salads to something glorious! Boil the pasta al dente 1 minute less than package directions. Drain, rinse and set aside to dry. Transfer pasta to a serving dish or storage container and drizzle with oil. Add the chopped shrimp, celery and green onion. Squeeze lemon over pasta and toss. Whisk together all of the dressing ingredients except pickle juice and fold into pasta. Taste and adjust seasonings. Cover and refrigerate for at least 2 hours. Just before serving, let rest at room temperature for 20 minutes, stir in pickle juice and tomato. Cooks Notes: We use highly seasoned shrimp leftover from a boil when making this. Click here for my shrimp boil recipe. If using frozen, already cooked, unseasoned shrimp, you will need to taste and make adjustments in the seasonings. May also substitute fresh tomatoes and when out of season and not at their best, you may substitute a (15 ounce) well drained can of diced tomatoes or Rotel tomatoes with green chilies in place of fresh tomatoes. I agree- Being right on the water for the fireworks display is the best seat in the house! My hubs and I stayed in a condo in Gulfport many years ago, and visited Biloxi. Loved the area! We were so sad to hear the most of the frontal coast there was destroyed by Katrina. Such beautiful old homes, and trees and DELICIOUS food! That's what I remember. You're recipe looks wonderful, as always. Oh, Mary... this looks really good. I make a lot of chicken-pasta salad, but never thought of using shrimp. I'm going to do it! Our 4th turned out to be a great day also. We were supposed to get rain but didn't. I love love love shrimp. Yum. That recipe looks divine and now I am craving it. Is there any left? I'll be right over. Looks yummy! What a lovely recipe, Mary. I'm so glad you had a good evening. De;icious macaroni salad. You won my old bay giveaway. Please email me with your naz..
Oh YUM! This looks DE-VINE! Sherri, we got hit hard - I'm a long time Biloxi girl & it broke my heart - BUT, things are coming back finally. Some businesses are popping up on the beach again and even homes are being rebuilt, and more important - tourism is coming back finally - so we're on the way. Karen, try the shrimp! You'll love it. Nana, let me know if you give it a try! LOL Bev - there is!! Donna, get out!!! I won??? Yay!! Already emailed ya the info. Hi TR! Hope you enjoy it! Mrs. T - I know.. LOL!! Looks like a great picnic recipe! My dad used to make something similar to this.... I'm drooling thinking about it. I'm printing the recipe as I type so that I can make next weekend! YUM! This shrimp pasta looks so delicious. I love seafood salads. I'm jealous that you can "fish" for shrimp where you live. Sounds like you had a nice holiday! finsmom, this would be a great salad for a picnic or potluck! Michelle, you should make it and reminisce!! Just add pease and extra Old Bay to it. 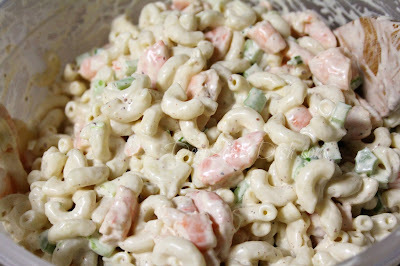 Love me some macaroni salad, never thought of adding shrimp -I use ham if any meat, normally- Gonna have to try this with the shrimps though. I do add my tomato when I add everything else but thats cause I like the way the tomato tastes after its had time to marry with the onion. Shrimp makes for a wonderful pasta salad! I've done it both ways but I prefer to add the tomato right before serving - I guess it's a texture thing for me and I don't really find that it affects flavor. I like the tomato to be bright and fresh & find adding it in before refrigerating & it tends to get a bit soggy so I just wait to add it just before serving. 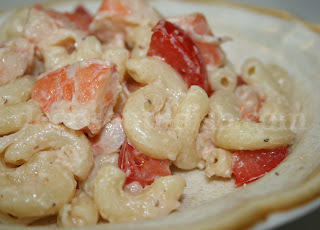 I also have a recipe up here for a ham & macaroni salad - a little different, but also very good! Thanks for stopping by & taking the time to comment. Could you use seashell pasta too? Hi Wayne! You sure could - any medium size short cut pasta will work really. You could use Miracle Whip if that's your preference! Keep in mind however that it is more of a sweeter salad dressing than a savory mayonnaise. The third ingredient listed after water and oil is sugar! If you're accustomed to using it in pasta salads you may prefer the sweetness though. My personal preference for dressing pasta salads is most often real mayonnaise and when I need to sweeten it a little, I just add a little sugar to it. Hope that helps!